Like the reanimated corpse at its epicenter, after two hundred issues and eighteen years of publication, Todd McFarlane’s Spawn is still slowly lurching forward. But as they say, the more things change, the more they stay the same, and despite the intimidating volume number and a new protagonist, this series is still in virtually the same place it was way back in 1992. A borderline giddy, nebulous all-encompassing evil still pulls the strings, while the modern carrier of the monster’s symbiotic battle armor fights a losing battle to loose himself from the fate that’s befallen generations of similarly strong-willed souls in the past. The identity of the two may have switched places a few times over the years, but it’s ultimately the same game with mildly different players. After toying with dedicated creative teams for decades, original writer-artist-creator Todd McFarlane has recently reclaimed both roles, perhaps inspired by the semi-recent creation of his second creator owned property in as many decades, Haunt. Sadly, many of the same handicaps that befell the once-talented artist in his first pursuit have not passed with age. Reading McFarlane’s writing is like drinking gruel through a straw – frustratingly ineffective, it’s ultimately unsatisfying. His cryptic, uncertain script is rife with hyperbole, long, fruitless diatribes and forced jokes. And, despite the ever-expanding word count in his scripts, the legendary creator still can’t concoct a legible plot thread. After sixty-plus pages, I’m still not entirely sure what I was supposed to take away from this issue. The story must have threatened to go somewhere twenty different times, but upon reaching the final page I wasn’t surprised to find it still treading water. With well over a decade’s worth of neglect in its past, McFarlane’s loose, undisciplined modern artwork is a limp parody of his better years. This month, faced with the prospect of a double-sized anniversary issue, he wisely splits pencil duties with Michael Golden, who can only do so much to reign in the madness that surrounds him. 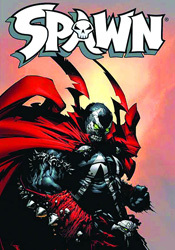 There was a time, particularly during the first year of Spawn’s publication, that McFarlane’s artwork was a revelation. At once elegant and disturbing, an uncommon marriage of excess and restraint, McFarlane was the hottest name in the industry for good reason. His experiments in layout were a breath of fresh air, his pin-ups worth the price of admission by their lonesome. In his modern work, McFarlane goes through many of the same motions, but they’re lacking the dedication and devotion that made his work sing in the ‘90s. Spawn #200 spills over with rushed, incomplete renderings, dull, half-hearted panel arrangements and bland, stiff action scenes. It’s like buying an album from your favorite band and realizing they just don’t have it any more. Though it’s spent years trying to shake the preconceived notions of what it’s all about, two hundred issues of Spawn have done little more than supply its critics with more ammunition. This issue’s non-story delights in nonsensical prose and ruthlessly illegible character interactions, but where past arcs could always fall back on the artwork to bail them out with a randomly-interspersed power battle, that means of escape seems no longer available. It’s an ugly, clunky tale paired with an artistic showing deserving of the same adjectives. Skip it.